GRACE shouted at her nephew, “Oh you naughty, naughty child! Did I not tell you not to come anywhere near the kitchen today?” Mpo stared down at the floor, his eyes brimming with tears. “Whatever is the matter, Sis Grace?” A concerned voice echoed in the passage, then Grace’s younger sister, Sihle, slowly made her way into the kitchen in her wheelchair. Grace was too angry to answer, as she tried to rescue her phone that had been drenched in the milk, which Mpo had spilled. On any other day, she wouldn’t have been so angry ­- but not today of all days! She needed the phone to access her recipes for the cake which she was baking for the final round of the Khumalo Bakery Glorious Cake competition. The winner would receive R150 000 as payment for the recipe which would then be exclusively owned by Khumalo Bakery. The whole nation had abuzz about this grand competition – it had been publicised on TV and on all the social networks. Sihle and Mpo left the kitchen. Grace was really more of a mother than an aunt to Mpo, whose mother had dumped him at his father’s home before she took up a scholarship in Canada. This was after her husband, Stephen, had died in a mining accident. Grace would never forget the day the mine manager had come with the news. What pained Grace the most was that the mine only assisted with the funeral. According to an official letter, the company could offer no compensation as their investigations had revealed the cause of the accident to be “negligence and failure to adhere to safety procedures on the part of the miners”. So the responsibility to look after the family had fallen on Grace – who had just finished her matric and passed well. Her mother was able to find work for her as a maid in the home of her former employer’s son. She’d enjoyed working there as she had free internet access and would spend hours browsing various recipes and following various food bloggers. She’d then practise some of the recipes on a special friend, a young man called Wesley, who supplied the ingredients – since she could never afford them herself. His kindness and love for her tasty food had led to a true friendship between them. She sometimes wondered if they could be more than friends, then dismissed the fancy, thinking, maybe in a different world. But often they would sit at the table, talk and laugh for hours after the meal had long been finished. TRAGEDY struck the family again when her sister and mother were involved in a car accident on their way home from church. Her mother died a few days later and Sihle was left wheelchair-bound. It had been a hard time for Grace, but she’d had to be strong for the sake of Sihle and Mpo. Wesley had been a pillar of support during the nightmare. Grace snapped herself back to reality, knowing that revising the sad facts of her life would not bake the cake. The sooner she started, the better her chances of winning and turning her life around. She decided to do a chocolate passion fruit cake. As she placed the cake in the oven, she whispered a prayer. 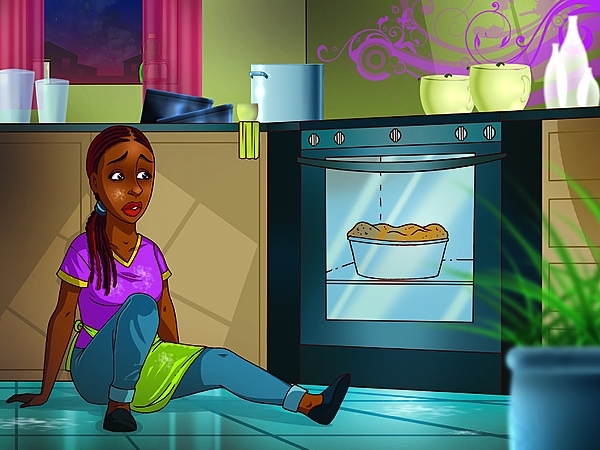 She was so anxious; she sat on the floor next to the oven, and watched as the cake rose into a delightful dome that promised to turn out into a masterpiece – until the dome collapsed! So Grace reverted to plan B: vanilla and strawberry cake. Immediately she got up and started to bake the second cake. This time she was too anxious to watch and decided to go outside. Her knees felt so weak she thought she was going to faint. When she returned to check on the cake, it was golden brown with delightful pink specks of strawberries. Grace gave a leap of joy and took out a skewer to test if the cake was done. But to her disappointment it was a still a runny batter in the middle.